Army Specialist Duane Topping served three tours in Iraq before medically retiring in 2012. Although he comes across as a tough guy with his tattoos and leather jacket, while deployed he found comfort from an unlikely place. Duane came to StoryCorps with his wife, Jamie Topping, to recall the difficulties of transitioning to civilian life while struggling with Post-Traumatic Stress Disorder. Today, Duane and Jamie run a successful design house out of Denver, Colorado. In September, they returned home from their first official show at New York Fashion Week. Top photo: Jamie and Duane Topping pose during their StoryCorps interview in the Topping Designs studio in Wheat Ridge, Colorado on May 17, 2018. Photo by Mia Warren for StoryCorps. 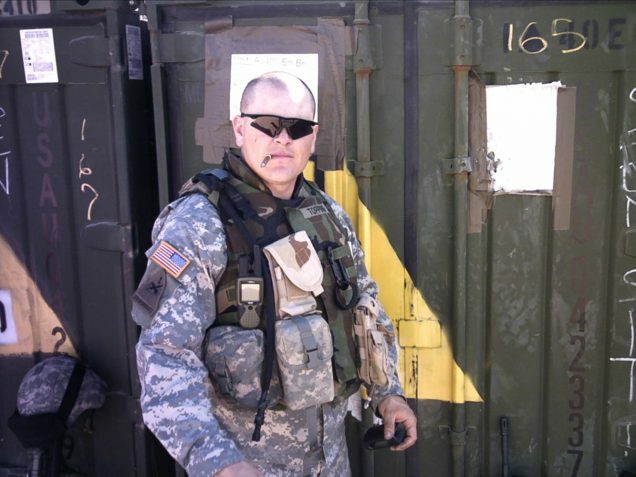 Middle photo: Duane Topping poses in Kuwait while deployed as an Army Specialist in 2006, during his second deployment to Iraq. Courtesy of Duane Topping. Bottom photo: Duane Topping works at his design studio in Wheat Ridge, Colorado. Photo by Mia Warren for StoryCorps. Originally aired October 6, 2018, on NPR’s Weekend Edition. Duane Topping (DT): I would go to where you could pick up care packages. And they’d split them up, male female. Well, I always went to the girl ones, ‘cause I liked, I liked the scents better, I liked the soap better. Jamie Topping (JT): I know, I would tease you. DT: I liked the lotion. I still do. Instead of the Sports Illustrated and Men’s Health, I would go find the Vogues and the Marie Claires. DT: Once I retired, I didn’t know what I was going to do with myself. DT: I mean, I tried being a motorcycle mechanic. That lasted about three weeks. And then, I don’t know, a number of nights and early mornings in dive bars and passed out in parks. JT: I would have to go and find you in the yard at night when you would have flashbacks. DT: Digging foxholes, I guess. JT: And I literally just shook my head. DT: Do you remember the first thing I made? DT: At first, It was just a hobby. And then, you know, it blossomed from there. JT: But it didn’t frustrate you, you just kept working. DT: — No, and that was just it. At that time it was so much about finding my peace. So much of the world is just noise. And for me, it’s that noise that brings the anxiety. When I sew, that world of noise and chaos is a world that I have control over. It’s only six inches. And that’s my six inches. And no one else can get in there. And I think, for me, that’s where the peace is.